Previously, we covered why Frank Sinatra is the Godfather of Mid-Century Modern, and now we check in on him in 1960 and see that he continued to personify the MCM lifestyle some 13 years after moving into Twin Palms. 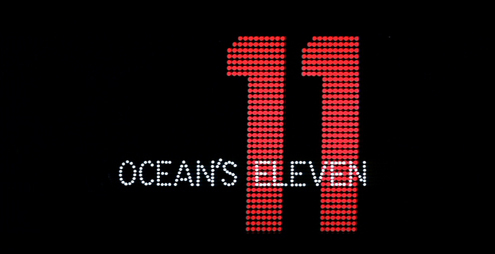 Ocean’s 11 released in August 1960, but began 2 weeks of filming on January 11, 1960. According to the exhaustively detailed commentary by Frank Sinatra, Jr. on the DVD re-issue, we learn that the vast majority of the movie was filmed on location in Vegas and inside the 5 casinos that were “being robbed.” This makes Ocean’s 11 a valuable snapshot of what Las Vegas once looked like, a celluloid form of historical preservation for a town that has no use for such things. Most of the movie’s action takes place in or around Las Vegas casinos, so there are only a small handful of Hollywood stage sets, like the one above. For the sake of brevity, I left out screen grabs that were solely dedicated to the lighting that was chosen for residential sets. Actually, for mid-century modern lighting and chair enthusiasts, this movie is highly recommended. Coral orange and salmon pink are the popular accent color of the movie. Another popular accessory in the movie is cigarettes; both the Rat Pack and Mad Men had a 3-pack a day habit, I swear! Sinatra’s character Danny Ocean masterminds a plot to rip off 5 casinos at one time on New Year’s Eve, and brings together his 10 best men to pull it off. They gather at this stunning mid-century home. Like most of the movie, it is an actual location rather than a set, in this case, it’s a home in Beverly Hills that was then owned by Hollywood theatrical agent Kurt Frings. According to Sinatra, Jr., Frings’ was surprised they wanted to use it for the film, but was more than happy to let them do so. This tidbit proves a conscious decision on someone’s part – maybe Sinatra? – as to what style of house these thoroughly modern rapscallions should gather in. The downstairs rumpus room in the Frings’ house covers just about every decorating trend of the late 1950s, including Tiki, Asian and African. There’s quite a bit of furniture (I lost track trying to count all the different types of chairs) and knick-knacks in this large room, yet it doesn’t look busy or fussy. This is one of the hallmarks of mid-century modern residential design: how to have a lot of stuff without looking like you do! …like the multiple showrooms in each of the hotels. Sinatra, Jr. was most impassioned when discussing how the casinos used to operate, “when they were owned by individuals, not corporations.” He explained that these intimate music lounges existed to “feed live music into the casino,” and give gamblers a place to eat and revive themselves for some more gambling. Each music lounge (like the Flamingo Room, above) took great care to book quality music and comedy acts, regarding them as being as big a draw as the gambling. Music or gambling, either way, they’d get your money. The reason the production got the actual hotels as sets in the movie was because the Rat Pack was actually performing in the Copa Room at the Sands for the 1959-60 holiday season. Once their shows were done for the night, filming began at 2:15 a.m. and they shot until it became too light. The production made a deal with the participating 5 casinos to leave up their regular Christmas decorations for a couple of weeks longer so it could play into the New Year’s Eve plot line. And here is the legendary Sands Hotel. It opened in 1952, was the zenith of Vegas entertainment by the time of Ocean’s 11, and closed in 1996, followed by an infamous implosion a few months later. Unlike some of the other lost hotels, the Sands named died with it. Here’s a diner from the original Sands casino, and a distinction must be made about the building types. As Sinatra, Jr. points out in the DVD commentary, the casino, showrooms and lounges were in a separate building from the hotel, and the hotels were no higher than 3-stories tall and situated behind the main building. Right next door to the Sands was the Desert Inn (and both places would be owned by Howard Huges by the mid-60s), which operated from 1950 to 2000. And like the Sands, once it was demolished, the name went with it. By the mid-1960s, the city of Las Vegas made a concerted effort to draw in more people by building a convention center, and more people required more rooms. This is the time period when high-rise hotels were erected, and so required massive renovations to the existing casino hotels. This is the gambling room of the Desert Inn as it was in January 1960. While not posh, it’s certainly more civilized than the lights-flashing-sirens-honking casinos we have now. The Riviera (shown above), which opened in 1955, foreshadowed the super hotel concept by being the first high-rise hotel erected on The Strip, and it remains to this day in the same location with the same name. But the building shown here is long gone. The new corporate owners that took over in the late 1960s figured – according to Sinatra, Jr. – “that people should only have to walk as far as the elevator to spend their money,” which is when the concept of separate buildings was jettisoned in favor of a a gargantuan hotel that could allow you to never set foot outside of it. The Sahara Hotel is the only other of the Ocean’s 11 5 that remain in the same place with the same name, but by 1963 they had begun serious renovations to the 1952 structure. By the late 1970s, Vegas switched over to the “mega-resort” concept, which was a way to make Vegas family-friendly which meant more money from different types of people flowing in. From the DVD commentary, both Sinatra, Jr. and Miss Dickinson are emphatic that luring kids to Vegas was the death knell for a once-great city, with Dickinson lamenting the disappearance of the last safe place for adults to be adults. Here’s footage from the film of Dean Martin performing in the Congo Lounge of the Sahara. Sinatra, Jr. was also very detailed about the death of quality entertainment in Vegas, explaining that the number of private lounges were reduced by new corporate owners who felt they were wasting their money with duplications of musicians throughout a casino. The disappearance of the small music lounges that were free-of-charge to gamblers did not seem to affect the flow of people coming through the doors, so the rest of the lounges were torn out, replaced by grand concert halls with high-dollar tickets that could lure in even the non-gamblers. After the robberies are completed, there are a few stage set scenes, with this office interior being one of them. I love the masculine drama of this room. But for the most part, 1960 Las Vegas is the star of Ocean’s 11, with cameo appearances by the Rat Pack and friends. And Vegas has always been about flash and money, so has constantly been changing to keep up with the cash, so any type of serious preservation of the Vega Strip was laughed off the street decades ago. Though there is The Neon Museum, the graveyard for so many of the wonderful neon sings that are the landscape of Vegas. They even turned the LaConcha Motel (which I covered in 2005) into their visitor’s center! But for the most part, photographs and memories are the historical preservation of Las Vegas, and the Rat Pack era is the one that seems to ignite the romantic imagination the most. Luckily, Frank Sinatra – the Godfather of Mid-Century Modern – left behind the most potent and complete snapshot of a time and a town.